Why deal with the hassle of hiring multiple musicians for your ceremony, cocktail reception and dancing? We do it ALL -- even DJ! Even with our extensive songlist, (500+ songs!) there are still some songs we don't know. Music is CONTINUOUS and SEAMLESS. Again, why deal with the hassle of hiring musicians and a DJ when we can do both! 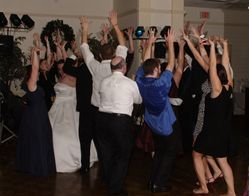 We can play for your ceremony, cocktail reception and dinner (or any combination of these), then DJ the dance portion of your event. It's the best of BOTH, with less people to coordinate. LESS STRESS. EASY. PROFESSIONAL. That's how we roll! Contact us, and find out how easy it is to create the perfect atmosphere for your special day.